October has been a variable month, veering from warm to cold to freezing, from spring buds and seedling growth to blossom profusion. And then we had a wild storm or two, one close to gale force, with winds roaring like freight trains, smashing branches and trees down and shredding gumleaves like confetti on the ground. As if on cue, only minutes later — through the kitchen window we saw, briefly, lightly, but unmistakably, the graceful swirling downwards dance of snow. There was another flurry later. My friend is buying a lottery ticket. 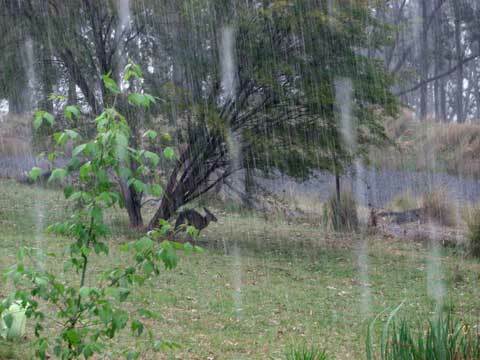 The other storm was not so cold or wild, but wet and loud, with thunder and tiny hail and rain like driven nails on the roof. 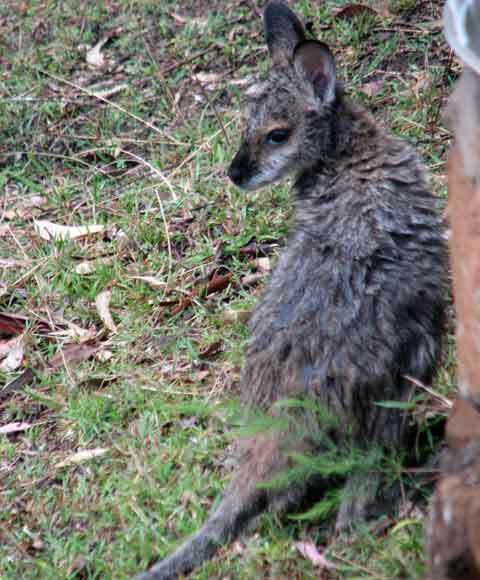 I watched from the verandah, bemused because the kangaroo family hadn’t sought denser shelter than my garden trees. Was it to do with the lightning? They slightly changed the direction of their positions but did not move from their chosen trees. I’d have thought a birch tree would give little shelter. And from where I stood, I couldn’t see one wallaby in the yard. When the drama was over and the sun had retired, summer storm-style, life returned to normal grazing — except beneath bedraggled pelts of wet fur. The wallabies must have been somewhere near, for the first one I spotted was this rather confused joey next to my house tank. Maybe they had been under the verandah? I hadn’t thought to look.